California's universities are getting serious about all-electric buildings. With governments squeezing carbon out of their power grids, zero-emission buildings will emerge as an important tool for reaching carbon neutrality by mid-century. It’s already happening in California. Two of the state’s universities, the University of California and Stanford University, are taking new steps to eliminate carbon emissions in their buildings. 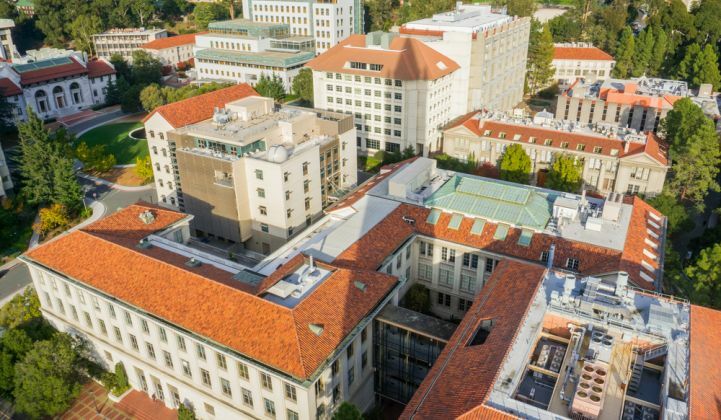 Earlier this month, the University of California announced a new sustainability goal: The massive public university system would seek to achieve 100 percent clean electricity across its campuses and medical centers by 2025. UC had previously announced its intent to be carbon neutral by that same year. The 100 percent clean electricity goal was not the only ambitious policy in the announcement. The UC Office of the President also established another benchmark: fossil-fuel-free heating in new buildings beginning next year. “No new UC buildings or major renovations after June 2019, except in special circumstances, will use on-site fossil fuel combustion, such as natural gas, for space and water heating,” reads the announcement. “We are making a lot of progress on zeroing out our emissions on the electricity side and finding it more challenging on the natural gas side,” Matthew St.Clair, director of sustainability in the Office of the President, University of California, told Greentech Media in an interview. According to a new Natural Resources Defense Council analysis, buildings account for 25 percent of California’s greenhouse gas emissions. “Space and water heating are by far the biggest uses of onsite fossil fuel combustion,” said St. Clair. There are, of course, other campus uses of natural gas such as generators, laboratory equipment and kitchen equipment. St. Clair said the successful completion of several all-electric building projects across the UC system convinced campus leaders to back the ambitious green building target. He noted that an all-electric laboratory building is under construction at Lawrence Berkeley National Laboratory, and an all-electric office building was recently erected by UC Merced. Several more all-electric buildings are either being designed or are under construction across the system. As part of a public-private partnership between UC Irvine and American Campus Communities, an all-electric student housing complex is under construction on that campus. With pride, St. Clair told GTM the developer had recently solved the last piece of the all-electric puzzle for the project. “They told me just a couple months ago they found an electric substitute for the last remaining natural gas use for that entire large housing development. It is the barbecue [grills] in apartments,” he said. St. Clair cautioned that the rule barring on-site fossil fuel combustion for space and water heating does not apply to new buildings that are connected to campus central combined heat and power (CHP) networks. Six of the UC’s 10 campuses have CHP facilities that burn natural gas. “We will be working over the long term on a carbon-neutrality solution for them,” said St.Clair. He added that much of the new construction systemwide is housing to accommodate increased student enrollment and housing projects are typically not connected to campus CHP networks. A similar effort is underway at Stanford University. In a presentation last month at the Electric Power Research Institute’s Electrification 2018 conference, Joseph Stagner, Stanford’s executive director of sustainability and energy management, said the university is nearing a decision on going all-electric in a new-build student housing complex. In 2015, the university completed its Stanford Energy System Innovations project, which replaced an aging campus natural-gas-fired co-generation plant with on- and off-campus photovoltaic power and advanced waste heat recovery systems. The project reduced the university’s greenhouse gas emissions by 68 percent and potable water consumption by 18 percent. Stagner cautioned that a final decision had not yet been made. “We are sincerely looking at that but need to determine if there are electric options for all the different appliances needed in a commercial kitchen before we can determine if we can go 100 percent gas-free in this next development,” he said.